At the turn of the century Britain was the foremost world power and the British Empire stretched over two thirds of the globe. Despite the extent of its power its most troublesome colony had always been one of its closest to it - Ireland. For seven hundred years Britain's rule over Ireland had been resisted by attempts at rebellion and revolution, all of which ended in failure. Then in 1916 a rebellion began to be followed by a guerrilla war that would change the nature of that rule forever. 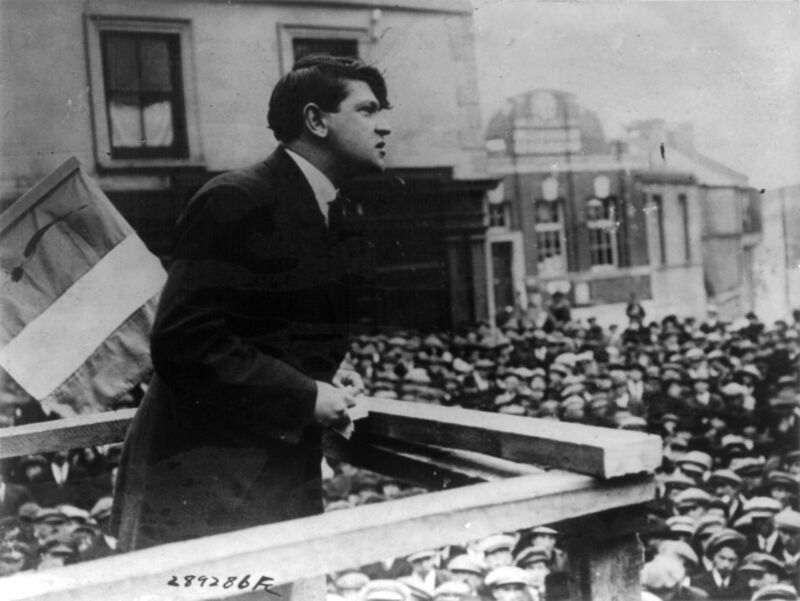 The mastermind behind the war was Michael Collins - Irish patriot and revolutionary. Written and directed by Neil Jordan Michael Collins (1996) sets out to define the period including its triumphs, the terror and tragedies. 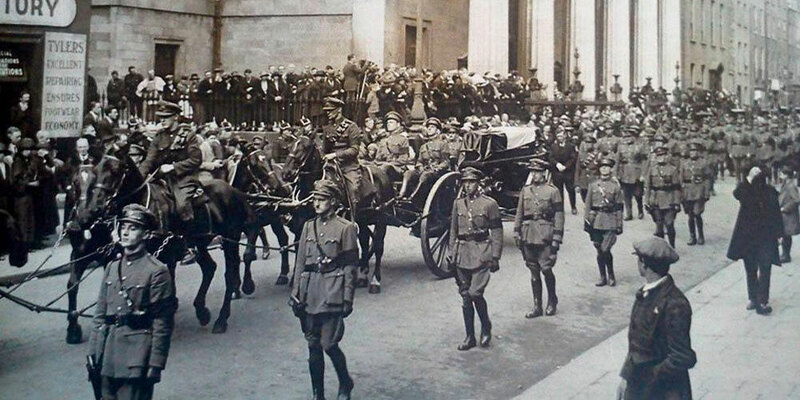 Michael Collins was the man behind Irish Independence; the man that it was said invented modern urban guerrilla warfare and fought a campaign to force the British Government to negotiate a peace treaty, bringing the powerful British Empire to its knees and round a negotiating table, which in turn led to the foundation of the Irish Free State. 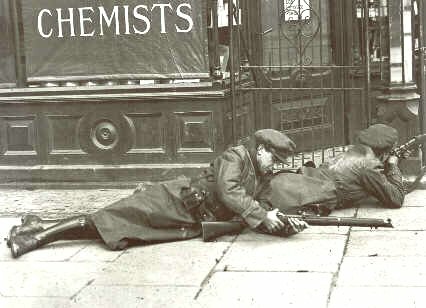 Aftermath of the Easter Rising. 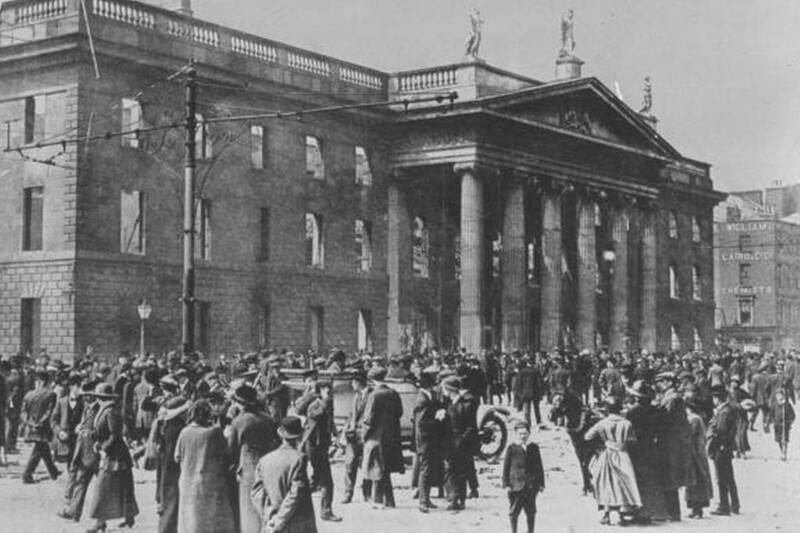 The film starts in 1916 with the Easter Rising, Collins was just 26 years old at the time and it was his first appearance in a national event, when 1000 volunteers in an armed insurrection occupied the Post Office and many other key buildings in the centre of Dublin as a protest against the British Government rule in Ireland and force it to establish an independent Irish Republic. The Rising, organised by the Irish Republican Brotherhood, began on Easter Monday 24th April 1916 and lasted for six days. Included in the action were members of the Irish Volunteers, Irish Citizens Army and Cumann na mBan a woman's paramilitary organisation. 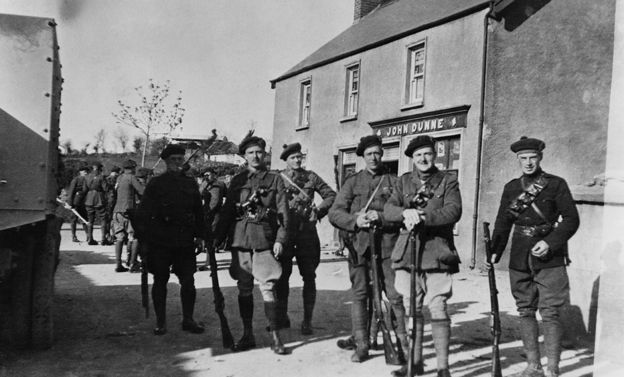 Although the general public of both Ireland and England did not support the uprising that all changed when the leaders were executed by a British firing squad. Amongst these was James Connolly the Scottish born Irish Republican and socialist who when he was executed only had a day or two to live having to be carried into the prison courtyard and sat on a chair unable to stand. A section of the Irish Republican Army. It was this action by the British government that drove Collins to take up what we now know as urban guerrilla warfare, which had the aim of avoiding massive destruction, military and civilian losses. Instead he directed a guerrilla war against the British with sudden deadly attacks on legitimate targets coupled with a quick withdrawal, minimising looses and maximising effectiveness. Film director Neil Jordan, who also wrote the films script, spent ten years planning to make a film about Collins and although it does include many historical inaccuracies it present’s an engaging study of the period and the hard and bloody fight Southern Ireland had to gain its independence. Jordan was quoted as saying the he would never make a more important film. Beautifully filmed by Britain’s best-known cameraman Chris Menges, it stars a first rate cast headed up by Liam Neeson as Collins, Alan Rickman as the powerful Irish political figure Eamon de Valera, Aidan Quinn as Harry Boland Collins right hand man for much of the initial struggle, with Collins and Boland’s love interest Kitty Kiernan played by the American actress Julia Roberts. Also playing their part in this exciting historical reconstruction are Ian Hart, Brendon Gleeson, Charles Dance and an early appearance from Jonathan Rhys Meyers. See also one most influential political films of all time The Battle of Algiers (1966). Gillo Pontecorvo film vividly recreates a key year in the Algerian struggle for independence from the occupying French in the 1950’s. A film that has a lot of relevance today.